This disc initially appeared as Marco Polo 8.223665 in 1995 and was reviewed here in that form in 1998. 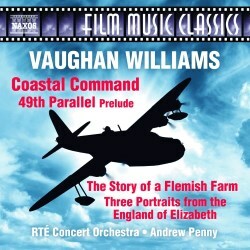 It was the first whole CD devoted to RVW's film music. While there is now a plenitude of his film music recordings - pre-eminently the three Chandos discs - this continues to work well as an inexpensive single disc survey. The 49th Parallel was my entrée to the world of Vaughan Williams' film music - his 'war work'; look at the dates of these films. As a student, I made a ham-fisted recording of the sound-track, complete with dialogue, using an old Philips cassette recorder and a microphone in front of the television. The Prelude is one of the most attractive of the composer's cinematic inspirations. It has a sweet nobility and epic stride all created and sustained here in the space of 2:15. Although some people complain of Bernard Herrmann's ponderous gait in the Decca CD (London 448 954 2 reissued on Decca Eloquence) the prelude also easily carries off the 3:22 treatment it receives there. Penny's performance still comes across with considerable majesty and power; not at all hurried. For those who would like to dig further there are atmospheric 1940s recordings of the piece on Pearl (review review). The Story of a Flemish Farm is represented by a suite. This was the first modern recording. The elegiac Dead Man's Kit has the pastoral stillness of the Fifth Symphony. Dawn in the Barn is a miniature genre piece like Constant Lambert's Aubade Héroïque. There is a brazen cold and cheery march to conclude the suite. The film Coastal Command was a wartime flag-waver. This suite was first recorded, movement for movement, by a 'crack team': Kenneth Alwyn and the Philharmonia on Silva Screen FILMCD072 and this migrated onto ASV-White Line. Before that there was a fine recording of the isolated Dawn Patrol movement by Sir Charles Groves with the RLPO (review). The sequence is distinguished by a magically impressionistic Hebrides and a dashingly gallant Hudsons. The finale includes a quiet poetic interlude out of which rises a brief gesture of great nobility. There is much to enjoy here although this does not quite match up to the Alwyn version. On the other hand the coupling on this Naxos disc is preferable. Three Portraits (Explorer; Poet; Queen) from The England Of Elizabeth was once recorded by RCA with the LSO conducted by Andre Previn. It was a make-weight for Previn's Boult-shadowing symphony cycle in the 1960s and 1970s. This little trilogy of 'pictures at an exhibition' is attractive with many delightful touches. Some of RVW's bombastic march moments ring rather hollow but there is so much here that touches the heart. Explorer (Sir Francis Drake) evokes danger and endeavour while Poet (Shakespeare) reminds us that RVW most affecting opera is Sir John in Love. This is a lovely movement with some pipe and tabor themes looking back (2:40) through 'Capriol' glasses to Tudor times. This mood is warmed by 20th century romance and then returns briefly to the world of 'Hey Nonny No.' The final movement, although celebrating the First Elizabethan age, also serves as a reflection of the confident New Elizabethan era. The Coronation pre-dated the writing of the music by only two years. A British Rail film, this was released in 1957, the year before the composer's death. Skirling pipes and something approaching Prince of the Pagodas glitter bring things to a close. Lewis Foreman's authoritative notes are a joy to read. They may well have been updated; I don't have the Marco Polo handy to make a comparison. In any event they are now dated 2016. By the look of it his research extended to viewing the films and hearing the music in context. The five stills from the films included in the Marco Polo issue are no longer there. If you are interested in film music but have not made any forays into RVW's contributions then do hear this splendidly recorded and performed disc. Vaughan Williams enthusiasts will already know that he did not drop into uninspired mode when working with films. There are tangs and flavours here that you will not have heard before. This joins other British contributions to Naxos' Film Music Classics: Bliss (8.572226), Frankel, Arnold and Sainton. What we need now is a systematic set of freshly made recordings of this composer's music for radio productions.